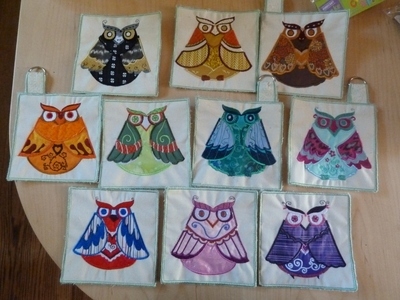 Applique Owl from Designs by Sick. I will make this into a totebag when I have finished the blank squares. Very cute...looking forward to seeing the finished product! Nice waiting to see the bag. love all your owls and I saw the bag loos great to. Now I know about the brown coloured Tag to click on it may bring back some older posts. Great. They look great. Love the fabric choices. Looks great! Live Laugh Download Stitch! That is going to be one really nice looking tote bag when you get it all done. Can hardly wait to see a picture when it is all finished. These came out great! Love you fabric choices! Beautiful love all the color. I have been sitting here looking enjoying for few mins. Will be a gorgeous totebag. This will be awesome........Love what you have done here!! That is a really good way of preparing for the handles! What a variety you have! They all look so different and there are so many of them. Good work! What are the totes for? I will put the handles on those!